The National Flood Insurance Program (NFIP) is in debt. About $24 billion in debt to be exact. It’s part of the larger debt we taxpayers are carrying because the program cannot collect what it needs to pay flood claims. But before you get bent out of shape about another tax burden, consider this. The program is in trouble because most Americans are not buying flood insurance or paying premiums as they should. To make matters worse, more major weather events are predicted this year and in the future. 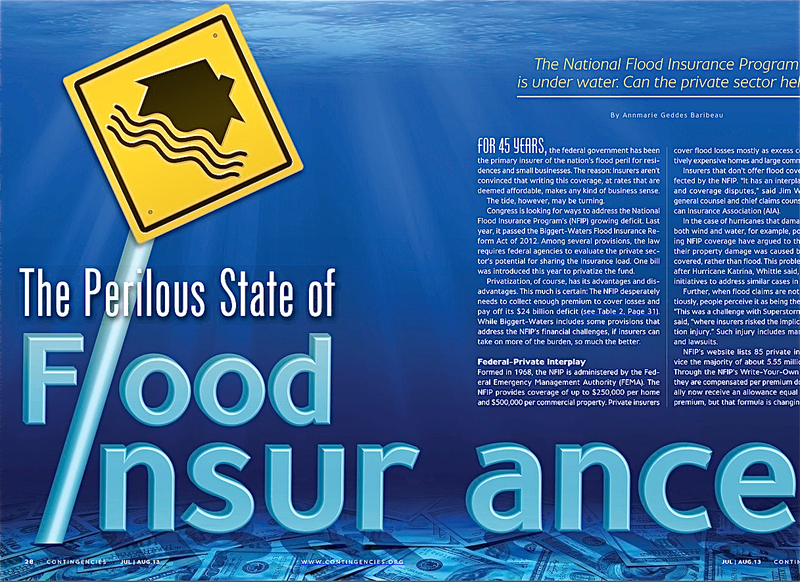 I cover this in my latest article, The Perilous State of Flood Insurance, in Contingencies magazine. Published by the American Academy of Actuaries, it provides a detailed account of the NFIP since Superstorm Sandy and reform signed into law by President Obama last year. The NFIP, which is part of the Federal Emergency Management Assistance program (FEMA), which is under the Department of Homeland Security, is just one major CAT event away from hitting the debt ceiling that President Obama and Congress extended last January. That CAT could easily happen this hurricane season, weather experts predict. The 45-year-old NFIP exists because the private insurance market cannot afford to offer flood coverage. Private insurers (your State Farms, Allstates and Progressives of the world) would need to double premiums currently paid by NFIP policyholders due to state solvency requirements. Flood damage is way underinsured. Just ask the folks in New York and New Jersey who did not have NFIP coverage. For their policyholders, NFIP covered about $7.2 billion in losses. The insurance industry as a whole picked up even more for commercial property and business interruption coverage. Those who were not covered, did not get a FEMA grant or charitable help were out of luck. Some people are still homeless because they missed the boat on having flood coverage. People do not buy flood insurance for many reasons. They either assume flood protection is covered through homeowners and renters insurance or say they cannot afford to buy it. (My grandmother used to say that if you cannot afford to take care of soemthing, you shouldn’t have it.) Some even hold out hope that they will get FEMA grant money, which of course, are more federal tax dollars at work. FEMA is releasing new flood maps that might be putting your home or commercial building into a flood zone. That’s because climate change means sea levels and major weather events are rising, which puts more of the U.S. population at risk for flood damage. Better measuring instruments are making maps much more accurate as well.I hope you will enjoy my article. Even if you do not read it, I hope you will call your insurance agent and make sure you are covered. It’s the right thing to do. For more information on insurance and deciding what kind of insurance you need, check out the Insurance Information Institute. They exist to keep consumers informed. 3 Comments on "Staying Afloat: Flood Insurance Is A Taxpayer Burden"